AVAILABLE SOON!Pre-order now shipping August 2018. A miniature Digital Data Link. The JetLabs SmartLink provides for full, individual Remote Control over various UAV subsystems and for long range wireless HD Video transmission. The JetLabs SmartLink uses the MISO technology which is a form of smart antenna technology which multiple antennas are used at the source (transmitter). The antennas are combined to minimize errors and optimize data speed and has widespread applications in digital television (DTV), wireless local area networks (WLANs), metropolitan area networks (MANs), and mobile communications. This technology has recently been adapted for use in high-end digital video links for FPV (First Person View) purposes. It is also ideally suited where real-time command and control is critical. 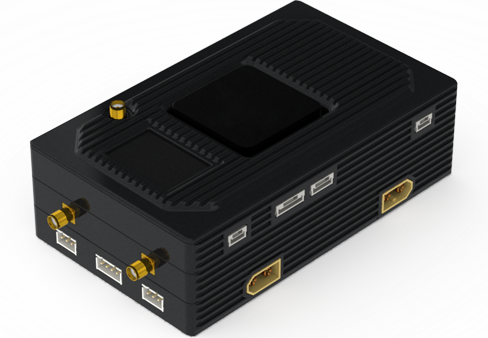 While providing for all the long range Video, Telemetry and RC (remote control) functionality in UAVs, the miniaturized form-factor also means that Digital Data Link-Mini fits easily into most commercial UAV platforms. The JetLabs SmartLink combines all the main RF devices commonly found in a UAV into a single device. There are multiple frequencies to choose from with 2.4 GHz being the most common. It comes with 128-bit AES encryption to both protect your UAV from outside interference AND to protect your privacy. There is on board IP Network which is used for the Video encoder. This can also be extended for other purposes. The on-board Video encoder of the JetLabs SmartLink provides you access to the video feed over the extended wireless network and can also be setup in multiple ways to allow for multiple cameras and network set-ups. 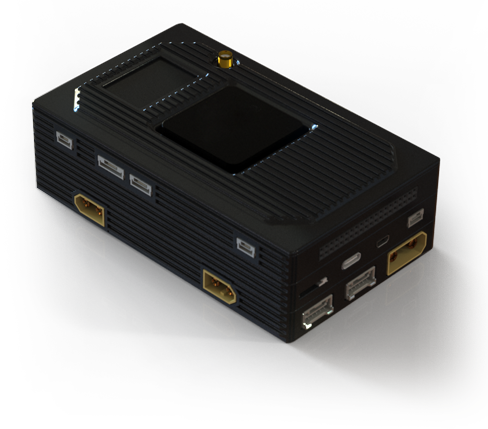 The technologies included in this design will result in higher performance with extended range, higher image quality and better reliability for critical and complex data applications and provide fast and secure, simultaneous Ethernet and Serial based data communication. It will enable UAVs, or any remote robotics, to handle many more of the challenges faced to date. These include the need for Ethernet Wireless Extension to give LAN-like connectivity conditions over an extended wireless environment to provide Wireless Telemetry and Wireless Video that can be used with Wireless Control Systems to control robotics remotely. The JetLabs SmartLink is the perfect solution for broadcast, inspection, aerial photography, crowd control, service robotics and a myriad of applications that require control of the camera in real time (FPV Experience). Takes the place of humans in SEARCH & RESCUE operations where the tasks are too dangerous, or not suited to humans. Speeds up WIND TURBINE INSPECTIONs in a safe and quick manner. Captures agile shots for AERIAL SHOOTING from complicated angles, not otherwise possible with human pilots on-board. Enables LAW ENFORCEMENT with an accurate, high definition portrayal of an overall scene, or zooming in on particular details. From the film studio to the operating theatre real-time, low latency connectivity between multiple high quality cameras and multiple monitors enabled by the JetLabs SmartLink, provide a new freedom of movement for both, camera operators and surgeons, in environment free from sprawling cables. Helical/ Clover option. Fixed antenna.